Sigung Darrell Gooden started his martial arts career over 30 years ago. His martial arts studies began in earnest, in 1976, while stationed at Kun San Air Force. He studied Tang Soo Do under Grand Master Lee Hon In and Grand Master Kim of Kun San. Both Grand Masters Lee and Kim were personal students of the founder of Tang Soo Do Grand Master Hwang Kee. Sigung Darrell Has since that beginning studied various martial art systems including Tae Kwon Do, Bak Shaolin Eagle Claw, Wing Chun and, to a lesser degree, familiarized himself with all the important movements in the martial arts and pugilist arenas. Sigung Darrell continues to be a student of the martial arts. In 1979 Sigung Darrell joined the Hang Ling Do Kung Fu Club of Santa Paula, CA. Hang Ling Do focused on Southern Shaolin five animals: tiger, crane, snake, leopard, and the dragon. Master Lee of Santa Paula founded the Hang Ling Do Kung Fu Club and personally mentored Sigung Darrell. Both Sigungs Darrell and Tom were leaders within the Hang Ling Do Kung Fu Club and since that time still works to promote the virtues of martial arts as espoused by Hang Ling Do. He has included the study of Eagle Claw under Master Leong Le Fu and Southern Praying Mantis under the guidance and instruction of Master Manuel Rodriguez of American Shaolin West Red Dragon Kung Fu Academy Ventura. Sigung Darrell holds a 5th Degree Black Belt Masters designation within the Hang Ling Do Club. He received induction into the Martial Artist Hall in fame in 2007. He was national ranked 3rd in forms competition by Inside Kung Fu magazine in 1983 and successfully competed and won Championships in tournaments throughout the US. 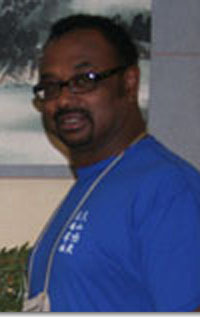 He co-wrote and produced Self Defense for Everyone video program. Sigung Darrell continues to stay engaged in “Chinese Boxing” as he calls his unique interpretation of martial arts, which is his life’s passion, by supporting the Mountain Institute for Kung Fu and Tai Chi and the American Shaolin West Red Dragon Kung Fu Academy programs and events. Sigung Darrell continues to teach “Chinese Boxing”. He also volunteers at his Church and lives in Oxnard, CA.